Relative landpower roles in terms of space, time, and strategic effect. The Strategic Landpower Task Force is an initiative designed to integrate the individual landpower roles of the Army, Marine Corps, and Special Operations community. Last October, the relevant leadership released a jointly-signed “white paper,” promising to work together to generate commonly held principles to guide the effort. So far, in terms of tangible product/doctrine, nothing has been released. All three services are still thinking…U.S. Army Training and Doctrine Command, for example, has requested academic papers on various topics related to strategic landpower. We don’t really have a solid definition of “strategic landpower” yet. Above, one can find my modest attempt at helping conceptualize the idea. If landpower is generally the ability to hold and control territory, then the Army, Marine Corps, and Special Operations community each have distinct strengths. These are depicted above in terms of space, time, and their strategic effect. Of course, one must recognize that the Marine Corps has a decided advantage in terms of force projection over the sea, while the Special Operations community is incredibly nimble and can access a wider range of targets. The Army is so big that it can legitimately claim a role in conventional deterrence. In my mind, strategic landpower is simply tailoring and synchronizing these different landpower strengths to optimize strategic effect on the opponent. Which combination can most effectively and efficiently get the job done? Can we get more from these forces than the sum of their parts? 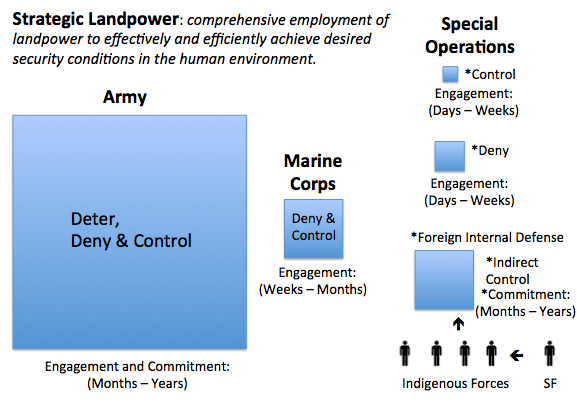 I’m not entirely in love with the definition I’ve presented in the graphic, but I do think it gets at the general idea with the phrase – “comprehensive employment of landpower.” And I’ve included “human” to emphasize that this is the defining feature of the environment (“human environment” defined as the sum of physical, psychological, cultural, and social interactions between strategically-relevant populations and operational military forces in a particular war or conflict. ).